This vintage 1971 ROLEX Datejust Thunderbird (we were told) was owned by a retired El Salvadoran Major of the El Salvadoran Army. All of the watches sold by “La Joya” (The official Rolex Dealer in El Salvador) have their own separate case rear exterior serial number as seen in my photos. This watch truly looks pristine after a recent full service and is running perfectly. The 36mm. case with solid 14k. THUNDERBIRD bezel glistens. The gold original dial and handset looks pristine. All the original lume plots are present. 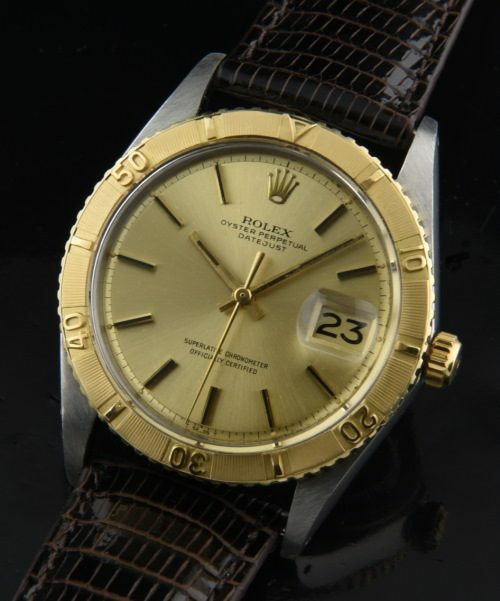 This is a prime example of a vintage ROLEX that will surely escalate in value. Grab this one fast.